Every software vendor blogs their top three, five, ten things you must do when starting a Software Asset Management (SAM) or ITAM program. On the conference side, I routinely have seen at the start of each IAITAM conference half the hands go up when the audience is asked, “how many people are at this conference for the first time.” It begs the question, is the SAM industry growing, or is it a revolving door of people coming and going? I do not know if the field is growing, but I have learned from over ten years in the SAM space, and collectively over 25 in software licensing, that SAM and ITAM managers struggle in the basics of setting up a SAM program and demonstrating value. For instance, who needs to be involved from my organization (and why), what processes are necessary (and where do they need to be), as well as what do I need to look for in my (audit) tool (what data do I need, how does it need to be reported, etc.). I’ve been privileged to partner with Itillion, who has been developing and supplying Software Asset Management solutions for over 20 years. More specifically, when speaking with Itillion, I’ve learned about their visual project management framework for implementing best practice Software Asset Management in your organization which they call SAM Essentials. 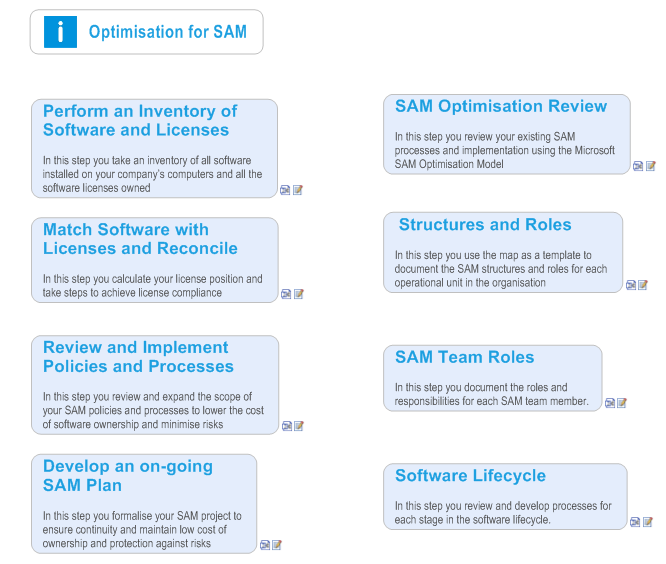 SAM Essentials includes ready-made project and process document templates to save (literally) weeks of work, design new or review existing processes against industry best practice following a step by step guides, communication of SAM to project to stakeholders and management and more. It allows you to assess your current SAM capability and set management objectives, make a sound business case to get management backing and resources. Best of all, the framework allows you to quickly plan, implement and control the project and communicate and collaborate with colleagues who will partner with you on the SAM implementation. For the US market, Itillion has partnered with ITAM Consulting Group to offer SAM Essentials. I’ve renamed the product the ITAM Implementation Starter Kit. It is a software asset management and resource kit that will help any organization start an ITAM program in as little as ten minutes. Really. When starting the application, the SAM Manager can begin inserting information immediately into the tool and start demonstrating value to the executive sponsor and organization. “This reminds me of the KISS principle (for those of you too young, KISS is ‘Keep It Simple Stupid’). I particularly liked this phrase as it came from a software tools vendor! He added, maybe instead of saying ‘stupid,’ maybe ‘SAM’ may come across better. You be the judge. The ITAM Implementation Starter Kit is available from ITAM Consulting Group. The offer includes a short demo of the product, and then up to 30 minutes of free consulting time within 90 days of purchase. To learn more, pricing (very reasonable) and details, please visit ITAMConsultingGroup.Com.